Goddess Fala Chen (陳法拉) has recently been busy shooting HBO’s miniseries The Undoing alongside award-winning actors Nicole Kidman and Hugh Grant. Preoccupied with making her Hollywood debut, the 37-year-old actress made time to return to Hong Kong to shoot a fat reduction advertisement and showed off her slim figure. 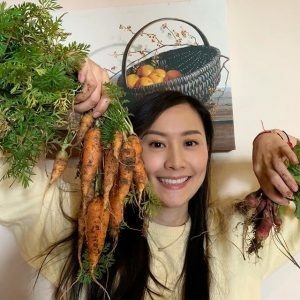 In an interview, Fala shared her own experiences of working hard for her own body and shared five things that she religiously follows. Self-proclaiming to be a “vegetable monster,” Fala eats a lot of vegetables and enjoys all types cooked in various ways. Her favorites are leek, stir-fry veggies, vegetable soup, and salads. On top of that, her diet consists of a lot of fruits and water. Instead of juicing, she will eat the whole fruit to get the most nutrition. She also takes appropriate vitamin supplements to ensure her body is healthy. When that is the case, her body will naturally appear beautiful as well. Aside from consumption, the actress also stresses the importance of implementing good lifestyle habits. She personally exercises six days a week and takes a break on Sundays – be it simply stretching or other workouts. Lastly, she sleeps for at least six to eight hours because staying up late will cause one to gain weight. very nice slim body indeed. i’ve never seen her out of shape. good for her.